We hear the term “Fintech” thrown around in the press regularly, however the term is not easily defined. At Acorn, we view Fintech as new financial technology that becomes an enabler for consumers or business in the Financial Services Sector. This technology might be in payments, accounting, money transfers, lending, investing, asset management, cyber security, digital currency, credit scoring, data collection, insurance, superannuation, cash management or NeoBanking to name a few sectors. Wherever it is applied, we define Fintech as an enabler of change and/or efficiency in the Financial Services sector. Fintech solutions have evolved to take advantage of the lack of agility in large financial institutions who are burdened with legacy IT systems that are not easily altered to adapt to evolving consumer or business behaviours. Fintech can operate in a client facing product or drive the back-end systems in a corporate enterprise and any mix of the two. One element common to most of these Fintech businesses is that the delivery of their solutions is via the cloud and its close relation, Software as a Service or SaaS. The flexibility provided by using cloud based computing for both the developer and the customer and the use of APIs (Application Programing Interface) has enabled small Fintech start-ups to build sophisticated products in niche markets at a competitive cost. Wealthtech – wealth management technology. Capital Markets – stockbroking/share trading technology. RegTech – technology to support clients meeting their regulatory and/or reporting requirements. Blockchain – public ledger transaction records and asset registers. Payments & Digital Currencies – advanced payment technology, ewallets, non-bank cash transfers. Data and Analytics – reporting tools for business. Personal Finance Management – digital budgeting tools & cashflow management tools. Lending – personal, SME and digital loan brokers. Crowdfunding – platforms that link startups with funding. Middle & Back Office – tech that assists financial businesses manage workflow. Acorn would add digital banking to this landscape also. At Acorn Capital, we have completed a number of Fintech investments over the past 3 years with a focus on Lending, Payments, NeoBanking and Superannuation technology platforms. We also have exposure to Block Chain and Digital Currencies as well as Personal Financial Management and RegTech. Acorn portfolios have been early supporters to the Fintech sector, with a significant portion of the exposure now generating positive cashflow and profits. HUB24, ZipMoney, Moula, Praemium, Pocketbook, Change Financial, Nimble, Kyckr, Class Super, OneVue, AfterPay are some of the Fintech names that we have looked at closely. This is the first of a number of updates in the coming months on how we look at the Fintech sector at Acorn Capital, and in particular we will look at some of individual holdings within the subsector definitions set out by KPMG in their Australian Fintech Landscape chart. The first sector we will cover is the so called wealth tech – technology supporting the wealth management industry. Amongst the significant holdings of Acorn Capital Investment Fund is a modern, independent, Portfolio Management Platform (Wrap Account), HUB24 (ASX:HUB). HUB has been a disruptor in the platform space over the past 5 years, providing a significant enhancement in user experience relative to the established institutions including BT, AMP and Colonial. HUB’s success has been driven by the flexibility of its platform for independent financial planners and its superior functionality in mobile. Investment Trends, an independent industry survey, periodically compares platforms in the market. The most recent survey ranks HUB first in overall platform satisfaction, Managed Accounts Functionality, ease of use and best tablet/smartphone access. HUB has been able to move ahead of the likes of BT, Colonial, AMP and Macquarie because it is a small, agile business that is focussed on technology and perhaps most importantly, is not burdened by legacy IT systems. 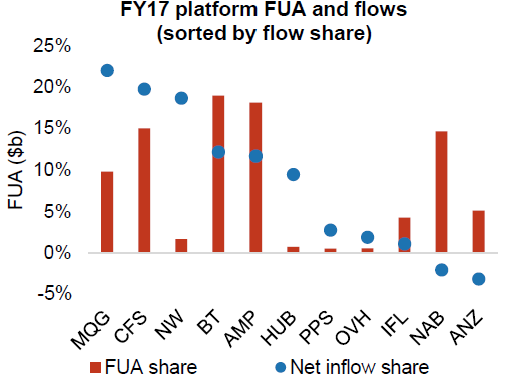 HUB currently has less than 1% of industry market share, but is winning 10% of all inflows into the Australian platform market, such is the dominance of its client solution vs the incumbents. 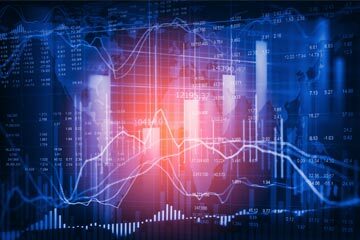 The recently listed Fintech Netwealth Group (ASX:NWL), has enjoyed similar sector trends and rankings and with HUB, highlighting the dominance of the independents in attracting fund inflows. The industry fundamentals of the Platforms and Managed Accounts space has meant that Praemium (ASX:PPS) and OneVue (ASX:OVH) have also presented attractive investment opportunities at various times over recent years. HUB’s superior technology and non-bank aligned offering means it is winning significant market share from Bank aligned platforms, driving funds onto its platform. As a technology based business, now that the majority of the technology has been built costs will grow much more slowly than revenues and as a result margin expansion will be rapid. We estimate that for every dollar of revenue HUB earns going forward, more than 70% will fall to the pre-tax profit line. 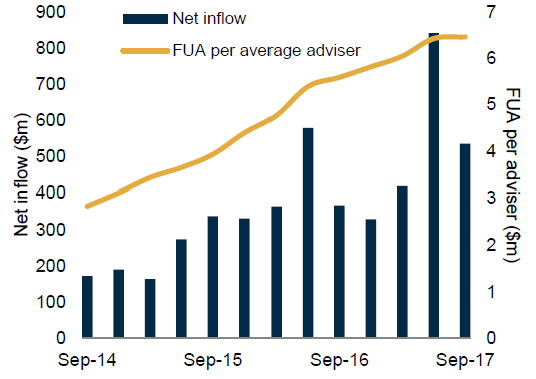 The planners using HUB have an average of $6m of client funds on the platform vs an industry average of $40m per platform per advisor. This means that HUB can materially grow its Funds Under Advice on the platform simply by increasing penetration into its existing planner base. This will occur organically as the business matures and planners and their clients become more comfortable using the platform. Whilst the stock has performed strongly over the past 3 years, we see HUB as a multi-year growth story and therefore expect continued returns for investors in the years ahead.